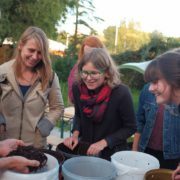 Green Student Bootcamp Challenge: Learn to Compost with Worms & Grow Food! 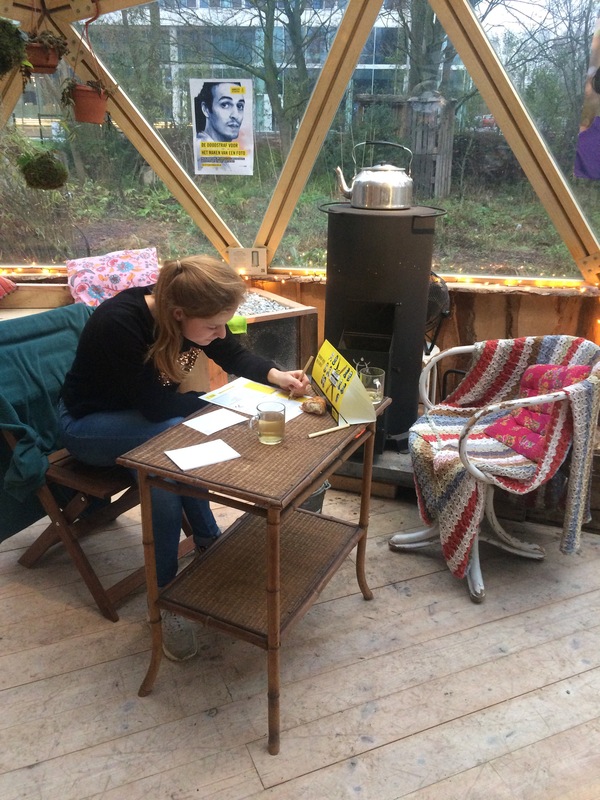 Suddenly November brought much colder weather and with it the challenge of heating our dome sufficiently to enable our activities to continue in the dome during winter. 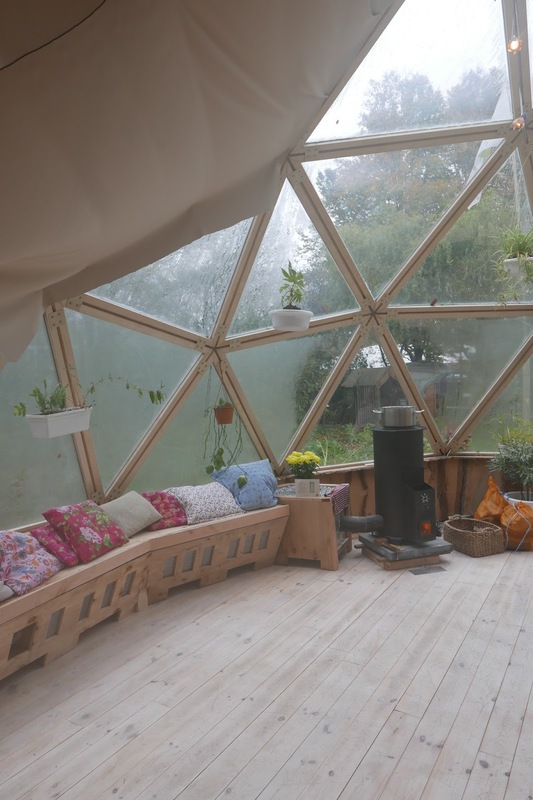 We wanted to find a heating solution high in energy efficiency, that could be easily fitted with the interior of the dome, and that provided multiple functions, in line with the permaculture design principles of all of the Green Living Lab facilities. 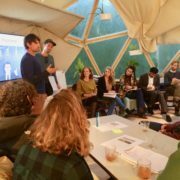 In early 2016 we built the Green Living Lab biomeiler as an experiment, with the objective of heating the floor of our dome. A biomeiler is a large heap of wood chips with water pipe laid in the middle. 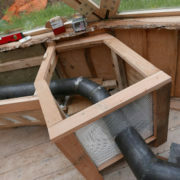 As the wood chips break down, the water inside the pipe is heated by the heat of the natural composting process and this warm water is then transported under the floor of the dome via a pump. Our biomeiler is much smaller than other biomeilers due to limited space on location. 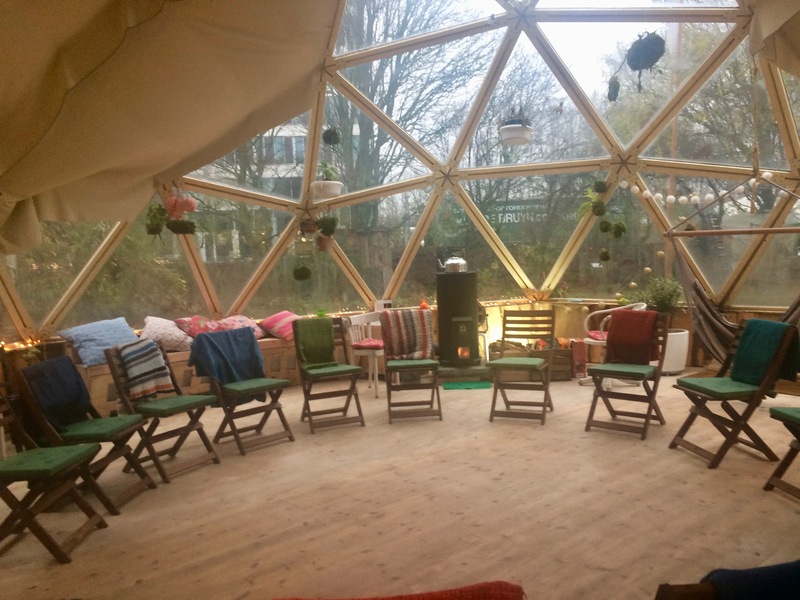 Although our biomeiler reached a temperature of up to 70 degrees Celsius and could heat the floor of the dome, we needed additional heat to make the dome warm enough for our guests to feel comfortable. 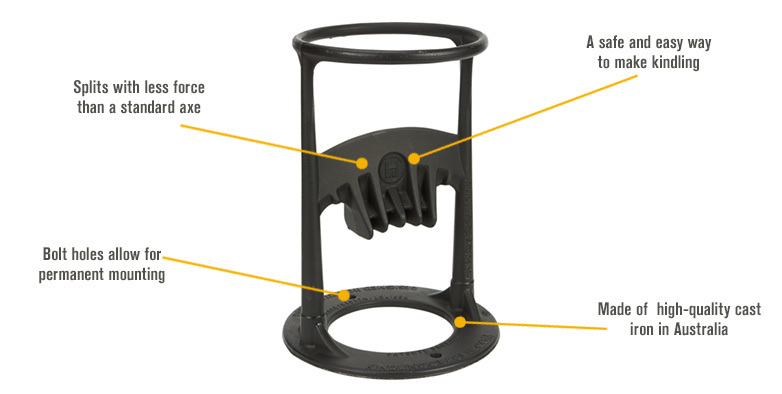 We now have this additional heat solution in the form of an efficient Rocket Stove from the Rocket Stove Store, with a mass heating system built around the rocket stove. 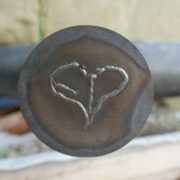 Beautiful Welding by Master Builder Ed Koevoet! Laureano Boerman from Rocket Stove Store has been an pioneer of rocket stoves for home heating solutions for several years. 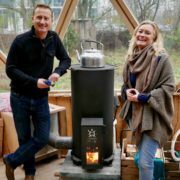 He now imports the first professionally built, ready-to-use rocket stoves to the Netherlands, that come ready to be installed for use as stoves in private homes. 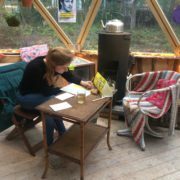 A rocket stove is an efficient mass heater that uses small diameter wood fuel and works via the principle of double combustion. What’s that exactly? First of all wood is burned in a combustion chamber containing an insulated vertical chimney. As the wood burns steam is released and C02 gas is trapped in the vertical chamber. This gas is then also burned, increasing the overall heat efficiency of the rocket stove. This means almost complete combustion, using up to 35% less fuel than conventional stoves, as well as significantly reducing emissions. 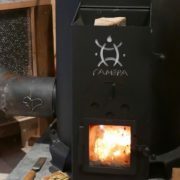 Laureano brought us a beautiful Ramepa Rocket Stove that not only looks elegant, it is also odour free, giving the pleasure of having a fire in the home without emissions. He advised us to consider using the rocket stove in combination with a heat absorbing mass: a Rocket Mass Heater. Building a Rocket Mass Heater around the stove, where the stove exhaust pipes are installed in some form of heat absorbing mass, would trap heat and keep it inside the dome for longer. 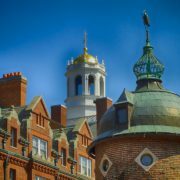 The mass heater would also continue to heat the dome after the fire has stopped, significantly reducing the amount of wood needed for fuel. Laureano introduced us to Jason Learned of Nomad Farmers. 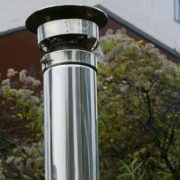 Jason is a sustainable living systems expert experienced in installing rocket mass heaters worldwide. 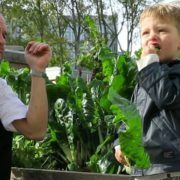 He is currently installing the new rocket stove at the beautiful KasKantine urban farm and restaurant in Amsterdam. 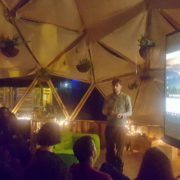 Jason advised us on the best way to integrate the rocket stove with the dome and told us how the stove’s exhaust pipe could be laid horizontally along the interior wall of the dome, in order to extract more heat, before the smoke inside the pipe leaves the pipe via the chimney. He also advised us to think about how we could trap more heat inside the dome using a heat absorbing mass. 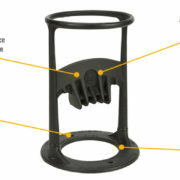 Our creative building wizard Rowin Snijder then began to develop a design to capture heat from the rocket stove pipe. 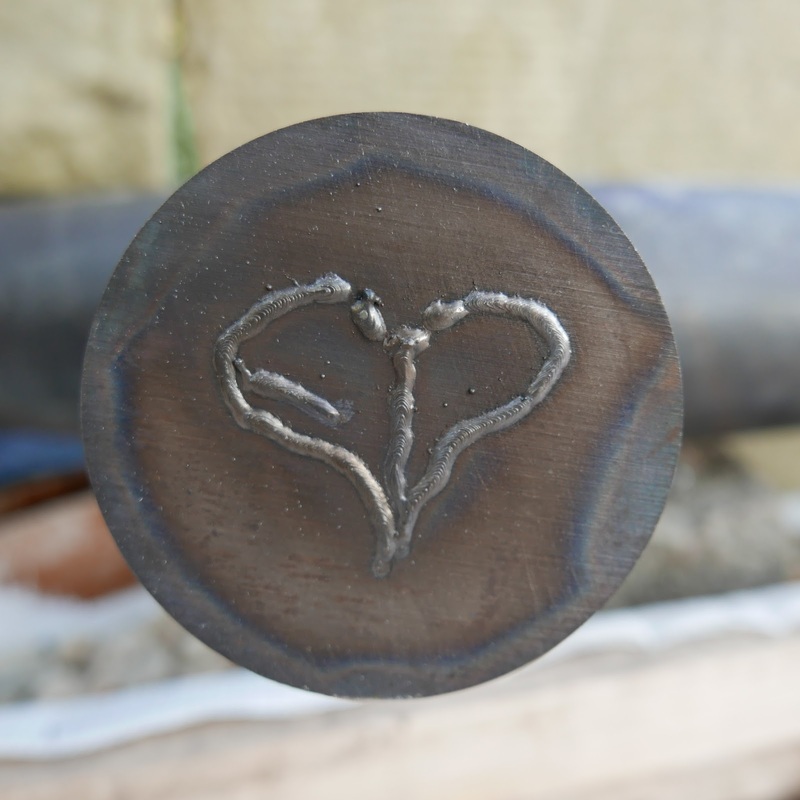 We were really lucky that the talented master builder Ed Koevoet was available to install the rocket stove and did a beautiful job welding the stove exhaust pipe. Rowin built a wooden bench around the stove exhaust pipe that transports smoke from the rocket stove, through the wall of the green slope on the outside of the dome, and into the chimney. The exhaust pipe inside the bench was encased with pebbles, as the combined surface area of these small stones provide a natural mass to transfer and store heat from the exhaust pipe. Rowin’s bench fits perfectly with the interior of the dome and provides a comfortable warm place for guests to sit and enjoy extra warmth while attending activities inside the dome. Laureano advised us on the correct way to make the fire inside the rocket stove, to ensure it heats up in the optimum way. It is important to make a vertical fire in the chamber with small, dry pieces of wood. To heat up quickly and evenly the small pieces of wood should be of a similar size. Instead of having to chop wood outside the dome with an axe in the cold weather Laureano came up with a solution, the Kindling Cracker. This handy device was invented by New Zealander Ayla Hutchinson for a school science project at the age of 13! 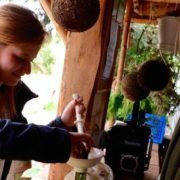 It enables everyone, including kids, to break larger pieces of wood into the ideal size needed to fuel the rocket stove with minimum effort. 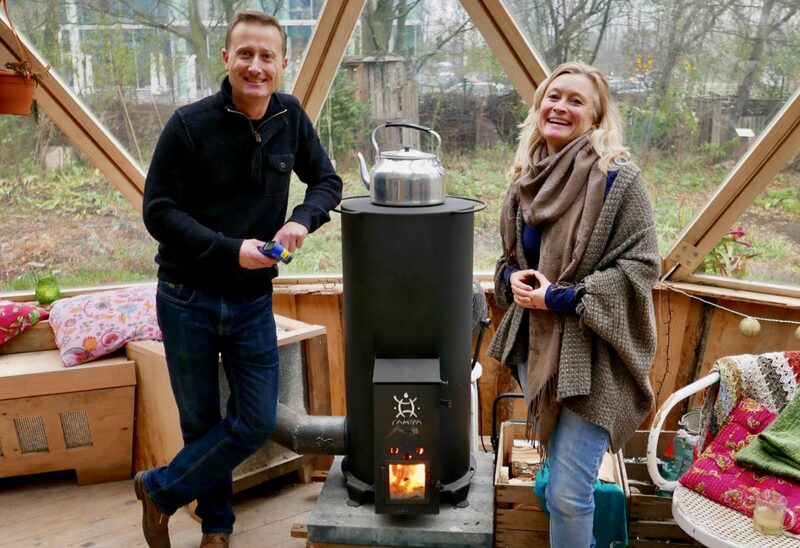 Laureano is just beginning to import the Kindling Cracker to the Netherlands and they are now available to pre-order at the Rocket Stove Store. 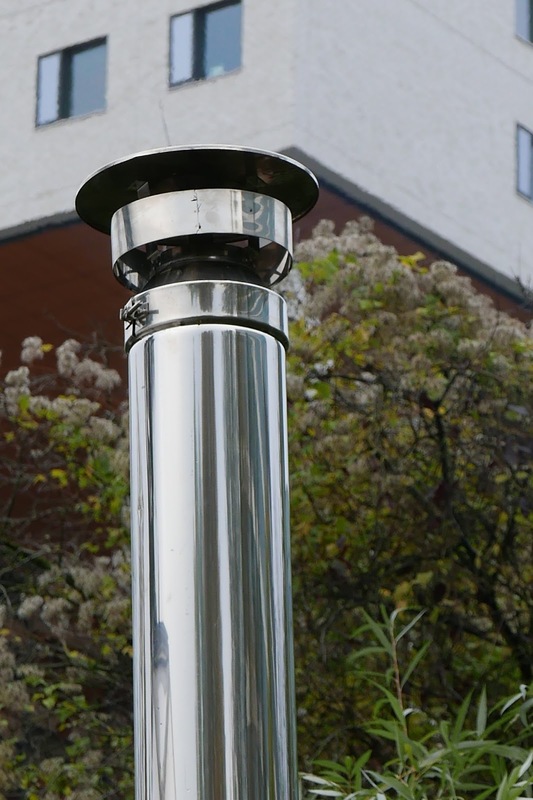 Rocket Mass Heaters provide a highly efficient, clean and cheap heating solutions for homes. As the heat is absorbed into the mass (small pebbles in our case), as much heat from the exhaust pipe is extracted and captured as possible before it leaves the dome. Another big advantage of using a mass heater is the type of heat emitted via conduction and radiation feels more pleasant than the convection heat of standard heating systems. The air inside the space is not dried out with a Rocket Mass Heater and the heat feels more natural and comfortable. Laureano tested the temperature on several occasions with a digital laser thermometer, to ensure all was working in an optimum way. So far the temperature on top of the rocket stove has been recorded at over 350 degrees Celsius. At the point where the exhaust pipe exits the dome, the temperature of the pipe inside the bench is around 40 degrees Celsius. This tells us that most of the heat is successfully staying inside the dome. About 1 inch of pebbles heat up every hour, so the whole bench is warm to sit on by the end of a day’s use. Just 1 hour after lighting the rocket stove the entire space inside the dome is heated nicely and the pebbles at the end of the bench closest to the rocket stove start to feel warm. We can heat a large kettle of water to make tea, make soup or pancakes on top of the rocket stove. 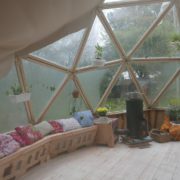 Our guests can enjoy the heat anywhere inside the dome and also gather around the stove itself to enjoy the feeling of being close to around a fire and get a nice view of the flames. The perfect recipe for cosiness! 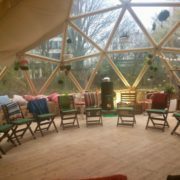 So a big warm thank you to Laureano, Ann-Kee, Ed, Antony and Rowin for creating such a perfect solution for heating the dome and for making it possible for us to stay warm inside! 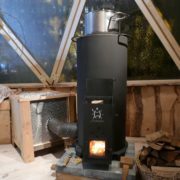 Please mention that you heard about rocket stoves via the Green Living Lab! 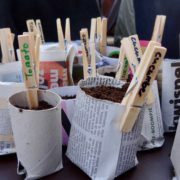 Wormenhotel Workshop bij het Green Love festival, zaterdag 23 juni, 15.00 - 15.45 uur! ?